This project is our answer to the question: what if the rumored interference by Roswell's first network hadn't taken place? Since taking up a collection to pay Jason Katims to write what he would have written didn't seem practical we decided to try to come up with our own version of those stories. We begin in the first season, at episode 117 just after "Sexual Healing," and go on from there. 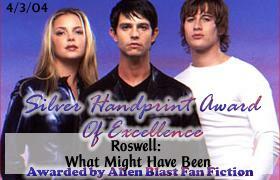 We began this project at the start of Roswell's third season, not knowing that it would be the final one. We present these season one and two virtual episodes as a tribute to an extraordinary show that touched our lives and ended far too soon. As of Feb. 15, 2012 we have started discussing episode 203. P.S. Since it has been a long gap between episodes, you might want to check out our synopses of recent episodes to refresh your memory. If you'd like to be notified whenever we post an episode, or update a category, please sign up here. Would you like a forum to discuss RWMHB episodes? Click here for more information. Feedback is the only way we have of knowing how you feel about the episodes and helps us to keep going when the task of producing these episodes seems too daunting, so if you want to encourage us to keep going please send feedback and/or inform your friends about RWMHB. Thanks. Fellow Roswellians have viewed this page times since August 15, 2002. This is an unofficial site. It is not sponsored, licensed, or approved by Warner Brothers, Jason Katims Productions, or Regency Television. Not affiliated with Fox, Fox Searchlight, Tribune, Time Warner or the WB or UPN or parent company Viacom. No copyright infringements intended.